In a famous 1955 speech, William McChesney Martin, the legendary Chairman of the Federal Reserve, declared that the Federal Reserve “is in the position of the chaperone who has ordered the punch bowl removed just when the party was really warming up.” Martin’s characterization of the Fed and monetary policy is brilliant and enduring. It explains why the stock market celebrates when the Fed stays on “hold”, and why the market is prone to a tantrum when the Fed raises interest rates. Staying on “hold” means more punch, while raising rates may mean sobering up. This paper uses the punch bowl metaphor to explore and illustrate monetary policy, to show what the Fed has been doing with the punch bowl, and to suggest how it might do things better in the future. The essence of the argument is that, for thirty years prior to the financial crisis of 2008, the Federal Reserve ran the economy with too much unemployment and slack, contributing to wage stagnation and income inequality. That undermined the aggregate demand generation process, necessitating monetary policy fueled debt and asset price bubbles to fill the demand shortage. The combination of inequality and debt bubbles has proven disastrous, creating mountainous debt burdens. We need a new model for monetary policy (i.e. a different way of managing the punch bowl) that delivers full employment with wage growth, while restraining excessive debt accumulation. 2. Who gets to attend the party? The punch bowl metaphor rests on the idea of an economic party. That raises the critical question of “who gets to attend the party”? The problem is the party tends to get started earlier on Wall Street than it does on Main Street. If the Fed decides to remove the punch bowl because of developments on Wall Street, Main Street may never get to attend. In practice, there are several different reasons why the current system operates to exclude Main Street from the party. Reason #1. Wall Street does not like full employment and works to obstruct it because full employment is associated with a lower profit share. 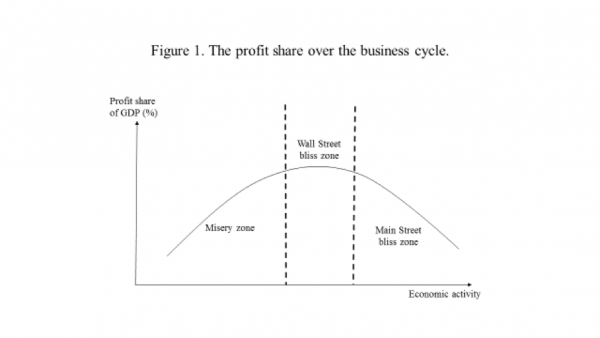 There is good evidence that the profit share is concave (shaped like an upside down saucer) with respect to economic activity, as illustrated in Figure 1. When economic activity increases (i.e. the unemployment rate decreases), the profit share initially increases as productivity increases and firms may also have a little bit more pricing power in goods markets. However, beyond a certain point, further increases in economic activity (i.e. further decreases in the unemployment rate) cause a fall in the profit share. That is because the boot shifts to the other foot, and increased economic activity increases the bargaining power of workers. This pattern generates three different economic zones. The first is a zone of misery where both Wall Street and Main Street would like stronger economic activity; the second is a zone of bliss for Wall Street where profits are at a peak and Wall Street would like the Fed to hit the brakes; and the third is a zone of bliss for Main Street that is associated with full employment. In the misery zone the stock market celebrates good economic news. In Wall Street’s bliss zone, the stock market prefers weaker economic news that is strong enough to keep the economy expanding slowly, but weak enough to keep the Fed on hold. That combination generates the so-called “bad news bull” phenomena. However, if the economy shows signs of surging into Main Street’s bliss zone, Wall Street is willing to accept higher interest rates to block that outcome. Reason #2: The switch to a policy of targeting low inflation has locked-in Wall Street’s zone of bliss. In the 1970’s the economics profession switched to focusing on inflation on grounds that monetary policy could not affect employment and output in any systematic way (Friedman, 1968; Lucas, 1972). Initially, that resulted in a new consensus that monetary policy should aim for price stability (zero inflation). However, a zero inflation target tended to land the economy in the misery zone, so the target was revised up and price stability was redefined as 2 percent inflation. That 2 percent target squarely lands the economy in Wall Street’s bliss zone. Given the Fed’s adoption of a 2 percent inflation target, that has institutionalized policy conduct whereby the punch bowl is left on the table until the economy is in Wall Street’s bliss zone, and it is removed once the economy starts drifting into Main Street’s bliss zone. Reason #3: Asset price inflation further locks-in Wall Street’s target and amplifies the punch bowl problem. Financialization has promoted asset price inflation and credit booms, which further encourages the Fed to stop short of full employment in two ways. First, asset price inflation and debt-financed spending give the Fed reason to raise interest rates to guard against financial fragility and price bubbles that could do grave damage if they burst. Second, asset price inflation can contribute significantly to general inflation via the cost of “shelter”, which makes up 30 percent of the consumer price index (CPI). Shelter costs consist of “Rent of primary residence (Rent)” and “Owners’ equivalent rent of primary residence (OER)”. OER is an assessment of the rental value of homes occupied by owners. When house prices go up, that tends to increase both components of the cost of shelter, raising general inflation. 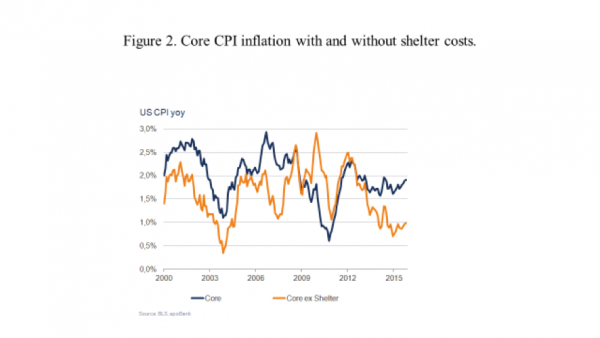 This is clearly evident in Figure 2 which shows core CPI inflation with and without shelter costs from 2000 – 2015. Periods of house price inflation (2000-07 and 2012-15) have been associated with core CPI inflation being higher than core CPI inflation ex-shelter. We can now put the pieces together. First, asset price inflation raises general inflation (core CPI inflation), pushing the economy closer to the 2 percent target and triggering the Fed to remove the punch bowl. Second, asset price inflation creates financial fragility, which may also trigger the Fed to remove the punch bowl. Third, because asset markets are speculative and forward looking, asset price inflation tends to shows up early in the cycle. Consequently, because of its 2 percent inflation target and fear of financial excess, the Fed has reason to remove the punch bowl long before the economy is close to Main Street’s bliss zone. Reason #4: The Federal Reserve is captured by interests that favor Wall Street. The above policy bias is hardwired within the Federal Reserve’s institutional governance structure which privileges commercial banks and the financial sector (Palley, 2015). It is also embedded via the institutional culture and personnel make-up of the Board of Governors and the professional economics staff. Central bank culture is predisposed toward finance, while the professional economics staff consist almost exclusively of mainstream economists who have substantially abandoned the Keynesian idea that monetary policy can systematically affect long-run real economic outcomes. In effect, the monetary policy framework of the past three decades has had the Federal Reserve pursue “stop-go” interest rate policy, raising interest rates to tamp down Wall Street exuberance and slow the economy before it reaches full employment, and then lowering them again to escape recessions. That framework contributed to the accumulation of imbalances that generated the financial crisis of 2008 and the ensuing stagnation. Stopping the economy short of full employment contributed to wage stagnation and income inequality that undermined the aggregate demand generation process: lowering rates jump-started the economy by starting a new cycle of borrowing, that cumulatively led to the build-up of massive debt burdens. That speaks to need for a new policy framework which allows the economy to reach full employment, so that wages can grow and perform their historic role as the engine of demand growth. It must also tame Wall Street to prevent financial instability, but without putting the brakes on employment and the real economy. In terms of the punchbowl metaphor, that requires a new policy recipe, new serving rules, and a new punch master. The economic party tends to start earlier on Wall Street, and also get rowdy on Wall Street before it has even started on Main Street. The Fed’s current serving rules have it taking away the punch bowl before Main Street gets to attend the party. The rules must change to enable the Fed to take away the punchbowl from different groups at different times. It should first take away the punchbowl from Wall Street, and only take away the punchbowl from Main Street when the party has reached Main Street. That would help avoid the two great failures of recent decades: wage stagnation and credit bubbles. Solving the problem of the party beginning at different times on Wall Street and Main Street requires the Fed have additional policy instruments. On Wall Street, the problem is asset price inflation and over-heated financial markets, which has repeatedly afflicted the economy over the past two decades: on Main Street, the problem is an over-heated economy that can generate excessive inflation. Wall Street and Main Street represent different targets, and policy makers need at least two different policy instruments to hit both targets. The challenge is to deter financial excess on Wall Street without undermining shared prosperity on Main Street. The solution is to supplement interest rate policy with quantitative monetary policy, in the form of margin requirements and asset based reserve requirements. Quantitative policy can then be used to manage Wall Street, leaving the interest rate free to manage Main Street (Palley, 2005, 2006, 2010, 2013). Metaphorically speaking, that would yield a new recipe for the monetary policy punch. Wall Street would be served quantitative policy punch, while Main Street would be served interest rate policy punch. Margin requirements refer to the share of credit-financed equity purchases that an investor must finance with their own cash. Raising the margin requirement makes credit financed purchases of stock less attractive because investors must come up with more of their own cash. Varying margin requirements is therefore a way of modulating stock market speculation. The Federal Reserve actively used margin requirements through to 1974, but since then it has neglected this policy tool and the requirement has been fixed at 50 percent. Restoring active use of margin requirements can provide a tool for targeting specific financial markets without taking down Main Street. Asset-based reserve requirements (ABRR) are a much broader form of control and require financial firms to hold liquid reserves against different classes of assets (Palley, 2000, 2003a, 2004, 2014). The central bank sets an adjustable reserve requirements on the basis of its concerns with each asset class. By adjusting the reserve requirement on each asset class, the central bank can change the return on that asset class, thereby affecting incentives to invest in the asset class. ABRR can provide a broad new set of policy instruments that address specific financial market excesses by targeting specific asset classes, leaving interest rate policy free to manage the overall macroeconomic situation. ABRR are especially useful for preventing asset price bubbles, as reserve requirements can be increased on over-heated asset categories. For instance, a house price bubble financed by banks can be surgically targeted by increasing reserve requirements on new mortgages. That makes new mortgages more expensive without raising interest rates and damaging the rest of the economy. In addition to being useful for controlling financial instability, ABRR have several other major benefits. First, ABRR have an automatic stabilizer dimension. As asset prices rise, financial institutions would have to come up with additional reserves to back them. Conversely, when asset prices fall, the ABRR falls so that firms receive an automatic injection of available liquidity. A second benefit of ABRR is that they increase the demand for reserves, which will be helpful as central banks seek to exit the current period of quantitative easing to avoid future inflation. By introducing and gradually raising asset reserve requirements, central banks can implement a form of reverse quantitative easing that absorbs liquidity and smoothly transitions the financial system to a new, sounder regime. Furthermore, it will also yield fiscal benefits by reducing the need to pay interest on excess reserves as financial institutions will be obliged to hold reserves to back their assets. A third benefit is that ABRR can be used to tackle the problem of Too Big To Fail (TBTF). TBTF poses financial stability threats, distorts competition by unfairly advantaging large banks, and poses political threats from the size of banks. ABRR can be used to shrink banks by imposing higher requirements on TBTF firms, giving them an incentive to voluntarily shrink themselves. There may be no need to break up TBTF banks. Instead, judicious application of ABRR can get the market to solve the problem on its own. Lastly, ABRR can be used to promote socially desirable investments and “green” investments that are needed to address climate change (Thurow, 1972; Pollin, 1993). Loans for such investment projects can be given a negative reserve requirement that can be credited against other reserve requirements, thereby encouraging banks to finance those projects in order to earn the credit. In sum, ABRR provide a comprehensive framework for collaring Wall Street and the financial sector, while leaving interest rates free to manage Main Street and the overall economy. If the central bank deems the party on Wall Street is becoming excessive, it can adjust its quantitative instruments to tamp down that excess without ending the party before it has reached Main Street. Adding quantitative policy to the monetary policy mix can provide the Federal Reserve with a way of controlling Wall Street without disinviting Main Street. However, the Fed will still need rules for deciding when to remove the punchbowl from Main Street, and that suggests the following new serving rules. First and foremost, the Fed should raise its inflation target to 3 percent, or even as high as 5 percent. The current 2 percent target is a cap that inevitably keeps the economy in Wall Street’s bliss zone, and prevents the party from reaching Main Street. The 2 percent target reflects a view that monetary policy cannot permanently impact output and employment, and only impacts inflation. Moreover, since inflation is undesirable, it should be kept low and stable. That view derives from the new classical macroeconomics of Milton Friedman (1968) and Robert Lucas (1972, 1976) which took hold of policymakers’ imaginations in the 1970s and asserts there is a “natural” rate of unemployment. There is strong macroeconomic evidence and argument for why slightly faster inflation can lower unemployment (Tobin, 1972; Palley, 1994, 1997a, 1998, 2003b, 2012a; Akerlof et al. 1996, 2000). The logic is that faster inflation is associated with higher prices and wages in sectors at full employment relative to those with unemployment, which shifts demand to sectors with unemployment. The inflation target is not set in stone. In the 1990s, the target was price level stability which translates into a zero inflation target. When that target proved to generate too much unemployment, the Fed raised the target to 2 percent and redefined price stability as stable low inflation. In 1978, when the Humphrey-Hawkins Full Employment and Balanced Growth Act (H.R. 50) was passed, the original intention was a 3 percent inflation target. However, 1978 was a time of high inflation and Republicans would only support the legislation if the long-term target was defined as 0 percent inflation. It is time to escape that political legacy. Former IMF Chief economist Olivier Blanchard (Blanchard et al., 2010) has also called for raising the inflation target to 4 percent. His rationale is a higher inflation target would result in higher normal nominal interest rates (normal nominal interest rate = inflation target + normal real interest rate), leaving more room to lower the nominal interest rate in the event of recession. Though Blanchard remains stuck in the new classical macroeconomics of Friedman and Lucas (i.e. there is a natural unemployment rate that inflation does not affect) and his justification for a higher inflation rate is non-Keynesian, he still arrives at the policy conclusion to raise the target inflation. That is good enough. The goal is a higher inflation target, and the more that economists of different persuasion concur regardless of reasoning, the better. Using quantitative policy to manage Wall Street and interest rate policy to manage Main Street still means the Federal Reserve needs rules as to when to lower and raise nominal interest rates. 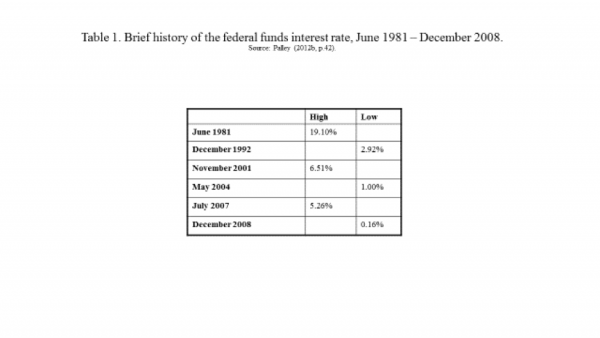 Currently, interest rate policy is widely framed in terms of a monetary policy rule – often referred to as a “Taylor rule” after a policy rule proposed by John Taylor (1993). That framework can be used to understand the need for change. Reflecting current theory, the standard Taylor rule suggests interest rates be raised when inflation is above target (lowered when below) and when output is above potential (lowered when below). Given actual inflation and output, the rule then determines the recommended nominal interest rate setting. When inflation is above target, the central bank sets a higher policy interest rate to reduce demand and lower inflation. Likewise, the central bank sets a higher policy interest rate when the economy is running hot and above potential output. The Taylor rule seeks to anchor policy to the real economy by reference to potential output or the natural rate of unemployment. Both of these real anchors are unobserved variables that need to be estimated, and the variance of estimates is large for both. An alternative real anchor is real wage growth, which should match the rate of productivity growth of if the equilibrium wage share is constant. According to a real wage growth targeting policy rule, the monetary authority should raise its nominal interest rate whenever actual real wage growth is above target real wage or real compensation growth, with the target being set at trend productivity growth (which is currently held to be 1.0 – 1.5% per annum). A real wage growth based interest rate rule would yield many benefits. First, there is tremendous uncertainty regarding estimates of full employment, which means there is a perennial danger of mistakenly tightening monetary policy before reaching full employment. With a wage based rule, policymakers would estimate trend productivity growth and then wait for the labor market to send a wage signal that the economy had reached full employment. The economic logic is that at full employment, real wages should grow with productivity to maintain constant income shares. Below full employment real wage growth tends to be a bit slower because of worker bargaining power weakness: above, it tends to be a bit faster because of worker bargaining power strength. Real wage growth therefore sends a signal from the labor market that helps identify when full employment is reached. Second, including real wage growth in the policy rule can help diminish mistaken reaction to inflation caused by house price inflation. That is because such a rule introduces separate policy responses to inflation and nominal wage inflation, reducing the interest rate response to inflation and strengthening the response to nominal wage cost-push inflation. That can improve policy timing. First, it helps diminish the premature tightening response to inflation caused by house price inflation. Second, it specifically responds to nominal wage inflation that can trigger generalized inflation, and which is only likely to develop when labor markets are tight and real wage growth starts to systematically outstrip labor productivity growth. Furthermore, the above policy frame makes sense in today’s globalized economy. The components of inflation due to weather, global commodity shocks and productivity growth are either entirely or largely beyond the reach of monetary policy. Contrastingly, the component due to wage inflation can be influenced via policy’s impact on macroeconomic conditions. Third, basing policy on real wage growth can help fix a major economic failing, which is wage stagnation and rising income inequality. Lack of adequate wage growth significantly explains secular weakness of demand growth. Directly conditioning interest rate policy on real wage growth will help remedy that. Fourth, by helping guard against mistaken policy tightening based on incorrect estimates of full employment, wage growth targeting will benefit all workers. However, it will be especially to economically disadvantaged groups who lack labor market bargaining power and are frequently subject to discrimination. The evidence from the last two business cycles shows full employment is the best spur to wage growth and the best way of ensuring workers get a share of productivity growth (Schmitt, 2013). The data also show that during these periods the wage gains of those at the bottom – which disproportionately means African-Americans, Latinos and women – strengthened the most. Fifth, like the standard Taylor rule, the wage growth targeting rule responds to counter deflation. However, whereas the standard rule only responds to price deflation, the wage growth rule also responds to nominal wage deflation. Sixth, there are political economy benefits to singling out real wage growth and attaching a target to it, as is done for inflation. The public and politicians know the inflation target number, which strongly encourages policy compliance. Announcing a real wage growth target would do the same for wage growth. The Federal Reserve would be publicly committed to the target and its actions would need to be consistent with that commitment. Furthermore, any change of the wage target would need explanation. For the past three decades, it has been easy to give monetary policy an anti-inflation bias. First, inflation hawks could assert the phantom of higher inflation was just around the corner. Second, the large variance of estimates of the natural rate of unemployment could support claims the economy was already past full employment. Adopting a real wage growth policy rule can substantially close those loopholes by requiring proof before action. In some regards, the Federal Reserve has already started to move in the above-suggested direction due to Chairwoman Yellen conditioning policy on her 10 indicator labor market dashboard, which includes nominal wage growth. However, nominal wage growth is just one of ten indicators so it has a small weight, and the dashboard is an informal tool that should be supplemented by formally articulating a wage growth interest rate policy rule. Lastly, it must be emphasized that all monetary policy rules should be viewed as providing a framework for assisting the exercise of discretion. Rules are not a substitute for discretion, and it would be the height of folly to set interest rate policy according to an algebraic formula. However, there is a legitimate place for rules as part of informed discretionary deliberations. A third change is to add the real exchange rate to the interest rate rule so that the Fed lowers rates when the exchange rate is strong relative to its warranted level, and raises rates when it is weak. There are several advantages to this. First, globalization has rendered the exchange rate an even more critical variable by increasing international economic integration, making manufacturing and the economy more sensitive to exchange rate effects. Moreover, the last four decades have seen several episodes of extended dollar over-valuation that have caused large trade deficits that have done great damage to U.S. manufacturing. Having the exchange rate in an interest rate policy rule would have the Federal Reserve policy explicitly counter such periods of over-valuation, thereby diminishing the dislocation effects of exchange rate fluctuations. Second, exchange rate appreciation generates unwanted price and output effects. Having policy respond to the exchange rate can neutralize the initial impulse rather than waiting till the damage has been done (in the form of those unwanted effects) to respond. That improves the timing of policy response. Third, once again, there are political economy benefits from incorporating the exchange rate into an interest rate rule. It would elevate the exchange rate as a policy variable, helping diminish the neglect of the last several decades. In particular, the exchange would now become an explicit variable of Federal Reserve policy consideration and open public discussion, in contrast with the current system that keeps it under the lock and cover of the Treasury. That raises an important question whether such a policy rule would be legitimate as the U.S. Treasury has formal legal authority for exchange rate policy. I would strongly argue it would be legitimate as the Fed would not be targeting the exchange rate. Instead, it would be using the exchange rate to target the nominal interest rate. In a manner of speaking, it already does that when it factors the condition of manufacturing into its interest rate decision. Since manufacturing is impacted by the exchange rate, taking account of manufacturing’s condition implicitly factors the exchange rate into policy. Having a rule would just do so explicitly. So far the focus has been the policy recipe and serving rules. The punch master, who mixes and serves the policy punch, also matters. Monetary policy is made by policymakers, and it matters who those people are because policy is impacted by policymakers’ beliefs about the economy, whether policy is effective and feasible, and what constitute policy priorities. One long-standing concern is undue and inappropriate policy influence of commercial banks. That influence derives from the ownership stakes commercial banks have in the district Federal Reserve banks, and it operates through those district banks. A second concern is a lack of diversity of representation within the Federal Reserve governance hierarchy, which is dominated by bankers and business and professional elites, who tend to be white and male. Correspondingly, the likes of ordinary people, people of color, unions and labor interests are under-represented. Together, the influence of commercial banks and lack of diversity tilts Federal Reserve policy in favor of big business and finance (i.e. delivers policies that peg the economy in Wall Street’s bliss zone). Policy is impacted by who is in charge (i.e. who is the punch master), which makes governance and representation critical issues for the Federal Reserve and monetary policy. That speaks to the need for a new punch master. As regards governance, the privileged position of the commercial banks should be eliminated by nationalizing the Federal Reserve system and ending commercial bank ownership. District Federal Reserve bank presidents should be nominated by the President of the United States and confirmed by the Senate. Commercial banks should contribute to monetary policy via advisory councils. As regards diversity, this requires appointing more ordinary people, people of color, and trade unionists to the governing boards of the district banks. It also requires actively seeking out the policy input of such persons and groups. Additionally, there is a deeper problem regarding the Federal Reserve’s staff of professional economists. That staff exerts a powerful influence on monetary policy via the forecasts and policy advice it gives to the ultimate policymakers, and Federal Reserve policymakers often graduate from the ranks of the professional staff. In effect, the staff influences the punch recipe and when to serve it. That speaks to the need to expand representation of different economic points of view within the staff, which is essential to avoid intellectual closed-mindedness and group-think. The economics profession is in denial of these issues. First, it succumbs to the view that economists can have access to a single “true” view (i.e. theory) of the economy. Second, it pedals the notion of “independent central banks” which are supposed to free policymaking of preference bias regarding economic goals (e.g. the inflation – unemployment mix). However, policymakers inevitability bring their own subjective preferences and beliefs to the policy table, which influences policy. That means there is no such thing as a central bank that is free of preference or belief bias (Palley, 1997b). It is possible to create an administrative process that puts distance between central bank decision making and the executive and legislative branches of government, but the preferences and economic beliefs of the punch master remain a critical matter that must be confronted. Monetary policy easing has historically been the standard response to cyclical busts. However, recent business cycle experience suggests the need for a qualified reconsideration. The problem is the Fed has bought into the neoliberal model of economic growth in which demand growth is driven by asset price inflation and debt (Palley, 2012b), and that buy-in may have gotten the economy hooked on punch. In that case, more punch alone is not the answer to hangovers caused by unstable credit-driven boom – bust cycles. Instead, the answer must also include replacement of the economic growth model. The inauguration of President Ronald Reagan in January 1981 is widely viewed as formally marking the replacement of the Keynesian economic regime, which had ruled since the end of World War II, with a neoliberal regime. In the Keynesian regime, demand growth had been fueled by wage growth, which was tightly tied to productivity growth and supported by full employment. The neoliberal regime severed the link between wages and productivity, in part by abandoning the policy commitment to full employment. In place of wage growth, demand growth was now fueled by debt and asset price inflation. The shift to neoliberalism was marked by longer business cycles of reduced amplitude, disinflation, and widening income inequality. The improved cyclical performance (1981 – 2007) was labelled by economists as the “Great Moderation”. The argument was that it was the result of more “flexible” labor markets, domestic deregulation, globalization, and a shift in monetary policy to low stable inflation targeting implemented by an independent central bank guided by a credible policy rule. The Great Moderation came to a crashing end with the financial crisis of 2008, which has been followed by prolonged stagnation. It is now clear that the Great Moderation was constructed on a false narrative. The reality was deregulated labor markets and globalization served to sever the wage – productivity link and increase income inequality. However, the adverse impact on aggregate demand generation was hidden by financial deregulation and a rising profit share that fostered asset price inflation and a thirty year credit bubble. The Federal Reserve also played a critical role in fostering the Great Moderation narrative. As illustrated in Table 1, the Federal Reserve lowered its policy interest rate every time the economy fell into recession, and that policy continued until the interest rate hit zero (the so-called zero lower bound or ZLB) after the financial crisis. In effect, every time the economy got drunk and suffered a hangover, the Fed delivered more punch to cure the hangover. That contributed to the delusion that all was well. Immediately after the financial crisis, it looked as if the “Great Moderation” policy paradigm was dead. However, it has been revived theoretically by Paul Krugman’s ZLB economics (Krugman, 1998; Eggertsson and Krugman, 2012), which seeks to explain stagnation as due to the zero bound on nominal interest rates. According to ZLB economics, if only interest rates could fall lower, the problem would be solved. In effect, the ZLB is interpreted as an obstacle preventing the punch master from serving more punch to cure the hangover once again. ZLB economics has served to foster measures such as quantitative easing (QE) and negative interest rate policy (NIRP), which aim to circumvent the ZLB obstacle and enable the punch master to ladle out another mega-serving of punch. However, what did not work before is unlikely to work this time. History is likely to repeat, in outline if not in detail (Palley, 2016). The Federal Reserve’s embrace of the neoliberal model has contributed to a dilemma in monetary policy that resembles the position of the alcoholic. After a binge, more punch can make the alcoholic (i.e. the economy) feel better, but only at the cost of increasing dependence and lengthening future blackouts. In terms of the economy, the cure is a new economic growth model that eliminates the need for ever greater servings of monetary punch. That is a task which goes far beyond the confines of standard monetary policy discussion, and it is one the Federal Reserve has avoided confronting. In the meantime, and as a first step, we should get the Federal Reserve to change the way it mixes, serves, and manages the monetary policy punchbowl. Akerlof, G.A., Dickens, W.T., and Perry, G.L. (1996), “The Macroeconomics of Low Inflation,” Brookings Papers on Economic Activity, 1, 1 -76. -------------------------------------------------------- (2000), “Near-Rational Wage and Price Setting and the Long Run Phillips Curve,” Brookings Papers on Economic Activity, 1, 1 - 60. Blanchard, O., Dell’Arica, G., and Mauro, P. (2010), “Rethinking Macroeconomic Policy,” Research Department, IMF Staff Position Note SPN/10/03, Washington, DC. Eggertsson, G.B. and Krugman, P. (2012), “Debt, deleveraging, and the liquidity trap: a Fisher-Minsky-Koo approach,” Quarterly Journal of Economics, 127 (3), 1469-1513. Fischer, S. (1990), “Rules versus discretion in monetary policy,’ in B. M. Friedman & F. H. Hahn, Handbook of Monetary Economics, edition 1, volume 2, chapter 21, 1155 - 1184, Elsevier. Friedman, M. (1968), “The Role of Monetary Policy,” American Economic Review, 58, 1 – 17. Lucas, R.E., Jr. (1972), “Expectations and the Neutrality of Money,” Journal of Economic Theory, 4, 103 – 24. ------------------ (1976), “Econometric policy evaluation: a critique,” in K. Brunner and A. Meltzer (eds. ), The Phillips Curve and Labor Markets, Vol. 1 Carnegie-Rochester Conference Series on Public Policy, Amsterdam: North-Holland, 19 - 46. Krugman, P. (1998), “It’s baaack: Japan’s slump and the return of the liquidity trap,” Brookings Papers on Economic Activity, 2, 137–205. Nikiforos, M., and Foley, D.K., (2012), “Distribution and Capacity Utilization: Conceptual Issues and Empirical Evidence,” Metroeconomica, 63 (1), 200 – 229, Special issues on Kaleckian growth theory. Palley, T.I. (1994), "Escalators and Elevators: A Phillips Curve for Keynesians," Scandinavian Journal of Economics, 96 (1). -------------- (1997a), "Does Inflation Grease the Wheels of Adjustment? New Evidence from the U.S. Economy," International Review of Applied Economics, 11 (1997), 387-98. ---------------- (1997b), "The Institutionalization of Deflationary Policy Bias," in H. Hagerman and A. Cohen (eds. ), Advances in Monetary Theory, Kluwer Academic Publishers. -------------- (1998), “Zero is not the Optimal Rate of Inflation,” Challenge, 41 (January-February), 7 - 18. -------------- (1999), "Speculation and Tobin Taxes: Why Sand in the Wheels can increase Economic Efficiency," Journal of Economics, 69, 113 - 126. -------------- (2000), "Stabilizing finance: The case for asset based reserve requirements,” Financial Markets and Society, The Financial Markets Center, Philomont, VA, August. -------------- (2001), “Destabilizing Speculation and the Case for an International Currency Transactions Tax,” Challenge (May/June), 70 - 89. ------------- (2003a), “Asset price bubbles and the case for asset based reserve requirements,” Challenge, 46 (May – June), 53 – 72. ------------- (2003b), “The Backward Bending Phillips Curve and the Minimum Unemployment rate of Inflation (MURI): Wage Adjustment with Opportunistic Firms,” The Manchester School of Economic and Social Studies, 71 (1) (January), 35 – 50. ------------- (2004), “Asset based reserve requirements: Reasserting domestic monetary control in an era of financial innovation and instability,” Review of Political Economy, 16 (January), 43 – 58. ------------- (2005), “A Post Keynesian framework for monetary policy: Why interest rate operating procedures are not enough,” in Gnos, C., and L.-P. Rochon (eds), Post Keynesian Principles of Policy, Cheltenham, U.K.: E. Elgar, 78 – 98. ------------- (2006), “Monetary Policy in an Endogenous Money Economy,” in Arestis and Sawyer (eds. ), A Handbook of Alternative Monetary Economics, Edward Elgar: Cheltenham, U.K., 242- 257. ------------- (2010), “Asset Price Bubbles and Monetary Policy: Why Central Banks Have Been Wrong and What Should Be Done,” Intervention, 7(1), 91 – 107. ------------- (2012a), “The Economics of the Phillips Curve: Formation of Inflation Expectations versus Incorporation of Inflation Expectations,” Structural Change and Economic Dynamics, 23 (3) (September), 221 - 230. ------------- (2012b), From Financial Crisis to Stagnation: The Destruction of Shared Prosperity and the Role of Economics, Cambridge University Press, February. ------------- (2013), “Monetary Policy and Central Banking after the Crisis: The Implications of Rethinking Macroeconomic Theory,” in The Handbook on Political Economy of Financial Crises, Editors: Gerald Epstein and Martin Wolfson, Oxford: Oxford University Press, Chapter 31, 624 – 643. ------------- (2014) “Monetary policy in the US and EU after quantitative easing: The case for asset based reserve requirements (ABRR),” Real World Economic Review, 68 (August), 2-9. ------------- (2015), “The Federal Reserve and shared prosperity: Why working families need a Fed that works for them,” Working Paper No. 389, Economic Policy Institute, Washington, DC, February. ------------- (2016), “Why Negative Interest Rate Policy (NIRP) is Ineffective and Dangerous,” Real World Economics Review, No. 76 (2016), 5-15. Also available at Private Debt Project, http://privatedebtproject.org/view-articles.php?Why-a-Negative-Interest-Rate-Policy-NIRP-is-Ineffective-and-Dangerous-20. Pollin, R. (1993), "Public Credit Allocation Through the Federal Reserve: Why it is Needed; How it Should be Done," in Dymski, G.A., Epstein, G., and Pollin, R., (eds. ), Transforming the U.S. Financial System: Equity and Efficiency for the 21st Century, Armonk, NY: M.E.Sharpe, 321 - 354. Schmitt, J. (2013), “The indispensability of full employment for shared prosperity,” in T.I. Palley & G. A. Horn (eds. ), Restoring Shared Prosperity: A Policy Agenda From Leading Keynesian Economists, CreateSpace. Taylor, J.B. (1993), “Discretion versus policy rules in practice,” Carnegie-Rochester Conference Series on Public Policy, 39, 195 – 214, North-Holland. Thurow, L. (1972), “Proposals for Re-channeling Funds to Meet social Priorities,” in Policies for a More Competitive Financial System, conference proceedings for Federal Reserve Bank of Boston, June, 179 – 89. Tobin, J., “Inflation and Unemployment,” American Economic Review, 62 (1972), 1 – 26, reprinted in Essays in Economics: Volume 2, New York: North-Holland, 1975, p. 33 – 60. Williamson, J. (1994), Estimating Equilibrium Exchange Rates, Institute for International Economics, Washington, DC. Nikiforos and Foley (2012) present empirical evidence for the US economy supportive of this pattern of income distribution over the business cycle. My thanks to Jakob Fiedler for this slide and pointing out this recurrent pattern. There is also a case for a Financial Transaction Tax (FTT). However, a FTT is policy instrument designed to reduce speculative trading and raise tax revenue efficiently (Palley, 1999, 2001). As such, it is a measure to shrink Wall Street and the size of the financial sector, rather than being a monetary policy instrument used for purposes of counter-cyclical stabilization policy. This automatic stabilizer property operates in a fashion similar to margin calls. The difference is margin calls are destabilizing since investors must pledge additional cash when prices are falling, which forces liquidation. ABRR work in reverse and are stabilizing. Yellen’s dashboard indicators are: official unemployment rate (U-3), broad unemployment rate (U-6), marginally attached worker rate (as share of not in the workforce), involuntary part-time rate, long-term unemployment rate (share of unemployed), change in participation rate, quit rate, hire rate, job opening rate, and nominal wage growth. The warranted exchange rate is the fundamental equilibrium exchange rate (FER) that delivers the target trade deficit (see Williamson, 1994). Palley (2015, p.6) argues the influence is also explained by the capture theory regulation, whereby the regulated (i.e. the commercial banks) gain control of the regulators (i.e. the Federal Reserve). The mechanism for this is the “revolving door” system and political contributions from commercial banks to politicians, who in return appoint “friendly” regulators. In fact, the transition to neoliberalism had begun in the late 1970s under the Carter administration, and President Reagan’s inauguration is better understood as the sealing of that transition.